www.ChampaignEnglishSetters.com ~ Champaign English Setters is owned and operated by Carl Bergen. Welcome to Champaign English Setters! Champaign English Setters is in operation due to my extreme passion within the pointing dog world and the pursuit of the perfect setter. We are not re-inventing the wheel, we are merely continuing a bloodline that is worth toasting. I love starting young dogs and working with puppies. Developing young dogs is what I love to do and the first year and a half is a wonderful time in a bird dog's life to be a part of. Watching that bungling awkward youngster bloom into a bird finding stylish fool is a very satisfying part of my life. Leaving the fire while developing a well mannered companion is the goal. 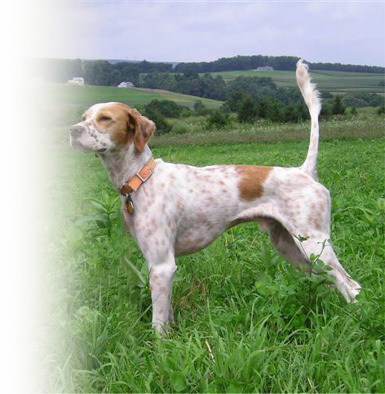 The Champaign dogs point young and continue to do that as they mature into fine competitors and hunting companions. Bird Dog and Retriever News. Click Here for HOT Kennel News. Click Here to view our latest additions to our kennel. For Upcoming Litters - Click Here.